In the autumn 2016, the Abruzzo, Lazio and Molise National Park (ALMNP), ENPA (National Entity for the Protection of Animals) and Salviamo l’Orso completed their stray dog prevention plan. The Plan was prepared with the cooperation of the regional veterinary services of Abruzzo, Lazio and Molise, the veterinary services of the local NHS primary centre trusts and municipalities in the ALMNP and its Buffer Zone. The plan involved the active collaboration of a public institution, the ALMNP, and their vet Leonardo Gentile, who provided means of transport and rangers. Volunteer associations represented by ENPA, an important national association, have sponsored part of the costs of the materials used, medical vehicles and a veterinary ambulance, as well as many volunteers who followed the Plan for several weeks. Salviamo l’Orso, our small association partner for this project which provided many vaccines, thanks to a donation from AISPA (Anglo Italian Society for the Protection of Animals), was represented by vet Luca Tomei. This Plan was aimed to prevent the spread of stray dogs, which is extremely prevalent in Centre-South Italy, ALMNP included. 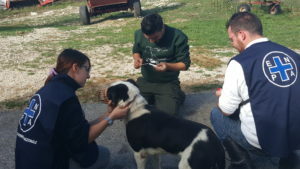 All sheep dogs in all local farms were microchipped (provided in part by Salviamo l’Orso), free-roaming dogs were captured, and with the owners’ permission, many dogs were neutered. Another important goal of the Plan was to control and prevent the spread of lethal diseases from dogs to wildlife; particularly to wolves and bears. It was decided that we would take random blood samples, nasal and rectal swabs from farm dogs, to verify the presence of the main infectious diseases most likely to spread to wild carnivores in the territory of ALMNP and its Buffer Zone. In addition, all dogs without a recall within the year before were re-vaccinated. Vaccinating dogs of livestock farmers against Parvovirus, Distemper, Canine Hepatitis and Leptospirosis in ​​the Marsican brown bear home range, significantly reduces the risk of disease and contagion for wild carnivores. This action took place from June to October 2016, covering a territory of 27 municipalities in three regions: Lazio, Molise and Abruzzo, reaching 342 livestock farms. A total of 1,093 owned dogs were treated over a period of 5 months. Of these, 730 dogs – almost 70% – were unknown to the Canine Registry and without vaccinations. So, from this point of view, the project was really a great success. About 40 dogs were only microchipped because they had been already vaccinated in the year, and 324 dogs, about 30%, were only vaccinated because they had been already microchipped. This information is very important because it indicates that only one in three dogs in the livestock farms, within the ALMNP, were registered in the Canine Registry, giving us a clear idea of how little is actually done at national, regional and local level to prevent stray dogs. Owners who have requested it were able to neuter their animals for free, in fact, 14 dogs were spayed and 32 were neutered in the area of Lazio and Molise. There are about one hundred operations booked in the Abruzzo region still to be made. In addition to the owned dogs, 10 stray dogs were captured and sent to partner refuges in agreement with the local mayors. So 1,103 dogs treated in total… What a great result!!!! The data of the Stray Dogs Prevention Plan should be a starting point for a broader discussion on the stray dogs issue at national and local level and at the level of protected areas. It is only if we all take action that we will be able to stem this phenomenon that is likely to threaten the conservation of wild species of inestimable natural and biological value. Salviamo l’Orso thanks the Abruzzo, Lazio and Molise National Park, ENPA and AISPA for their partnership in the achievement of this extremely important goal! Special thanks to Dr Luca Tomei, our member and Volunteer Vet, who made all this come true!